The HyperCarnivore: Slow Roast Beef, Turkey, or Chicken ~ Roast Once, Eat Twice or Thrice! Slow Roast Beef, Turkey, or Chicken ~ Roast Once, Eat Twice or Thrice! Slow Roasting meats is a fool proof method for preparing beef roasts. However, nearly any type of meat can be slow roasted. Typically, the meat ~ whatever you may be preparing ~ is placed in an oven at a very high temperature for the first 15-20 minutes. This sort of sears the outside of the meat. The temperature can then be turned down either in increments, or all the way down to roast ~ covered or uncovered ~ for several hours. Often, the longer the better. You can't really over cook a roast when prepared with the slow roast method! I'm always amazed how pink the meat is on the inside, despite being in the oven for nearly 6 hours! This is the ideal cooking method for busy people! Put it in the oven, then go about your day. Come home to a ready-made meal! the Chuck Roast we often buy, but I like the flavor. I did add a little of the Beef Bone Broth, including the nice layer of fat from on top to the roasting pan. Very nice flavor, and very tender! I recently recorded another video making a slow roast, however, unfortunately, I must not have recorded the very first part as I thought, because I never found the footage. But, the recipe is in there, and you can see how pink the meat comes out in the video, and in the pictures, below. 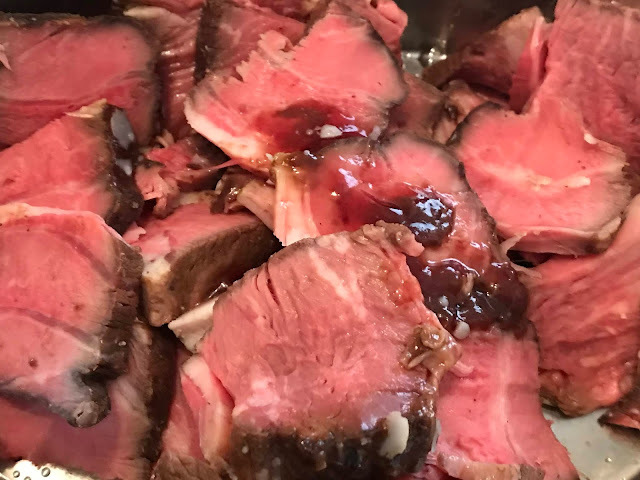 Whatever roast beef, or other type of meat you are using, it helps to let it sit out for 15-20 minutes before roasting to come up to temperature. That being said, one commenter on the YouTube video mentioned putting the meat in frozen and letting it roast at 280º (I think that's what she mentioned) the entire time. She cranks up the heat to a broil at the very end of the cooking time. A similar method, in reverse. We typically prefer to leave our beef roasts uncovered, which helps it to remain pink, and not over cook. We often prepare one fattier chuck roast, and one leaner roast at the same time. Save time later in the week, and roast 2 at once! Pre-heat oven to about 450º. Place roast in roasting pan. If using vinegar, add about 1/4 - 1/3 cup to a small bowl. Add crushed garlic if using, and measure 2 tsp. salt. If using pepper, or any dried herbs, they can all be stirred into the vinegar. Stir together. Use a pastry brush to brush all over the roast. If using a leaner roast, use a butter knife to spread some beef tallow on top, and/or leave a couple teaspoons worth in the roasting pan. The fat on top of the roast will help it brown quickly, so do be careful. If desired, just keep it uber simple. Season the roast generously with salt, and if using, black pepper and any other dried herbs. Just salt and pepper are fine on their own, but go for whatever flavor you like! Pat a little bacon fat or beef tallow on top and on the sides of leaner roasts. Roast at the high temperature for about 15 minutes. I can usually begin to smell it roasting when I know I need to turn the heat down. Otherwise, set a timer! Don't over roast it at the higher temperature! Turn the heat to 225º. Add broth/water to the pan, and let it roast for up to 6-8 hours. You can baste the roast with the juices at the bottom of the pan. If the pan is really dry, add a bit more bone broth or water, and possibly a little bacon fat or beef tallow, then baste the meat a couple times throughout the cooking process. You really can't over roast it if it is at the low temperature. It just gets more tender, yet remains pink inside! If you need it quicker than 6 hours, just check the temperature, or do a quick cut and see if it is tender enough. In the past, we would satué onions in our good ole durable and fairly beat up Le Crueset Dutch Oven Pot in some (homemade) beef tallow first, then place the roast on top, cover it and place it in the oven. You can add chopped vegetables and some bone broth to the pot to make a more traditional pot roast. Cover once you turn the heat down. Each will yield a slightly different finished roast. It depends on the meat you are using, and what you prefer. So many ways to vary your slow roast! One thing is for sure, this is a great method for preparing super tender meats. As I've said here and elsewhere, when you plan ahead, you can roast once, and eat twice or thrice! Roast a beef and a chicken at the same time, and meal prep through the week will be a breeze! The meat gets better tasting each day. Even during the summer heat, the oven is only at a high temperature for a brief amount of time. The low heat doesn't heat the apartment up too much. Of course this could also be replicated in a Crock Pot. I would probably start it on high for the first 1/2-1 hour, then turn to low, or according to instructions of your slow cooker. Let it cook away while you work, and come home to dinner! Have sliced meat with some bone broth, and anything else you like and you are good to go. Super simple meals. In the past, we've done this same method for whole chickens, and turkey breasts. Place the turkey breast in your roasting pan. Squeeze fresh orange or lemon all over, which helps tenderize the meat. Generously season with salt all over, and any poultry seasonings you like, such as dried sage or thyme. Let it sit uncovered in the fridge over night. It can sit there a couple days if needed. When it comes time to roasting a leaner meat like turkey breast, I will add pats of butter all over the breast, especially under the skin. Place in oven pre-warmed to 400-450º. Roast at the higher temperature for 15-20 minutes, or roughly five minutes per pound. 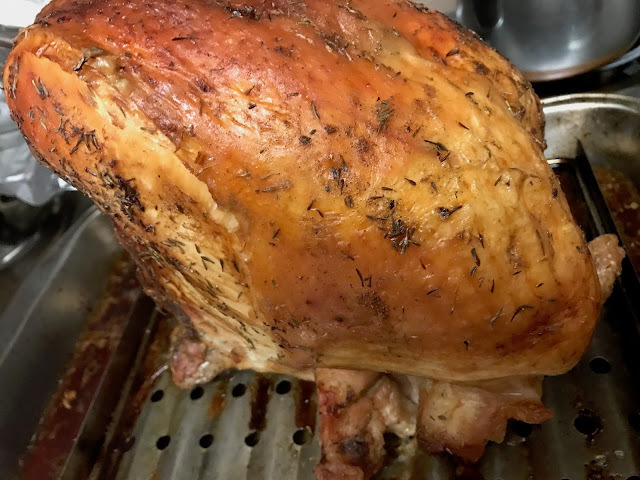 Once it starts to get a little browned on top, turn the heat down to about 250º, and roast for 2-3 hours, or until a thermometer measures 145-150º or a bit more. The juices should run clear. Be sure to check the temperature at a thicker area. 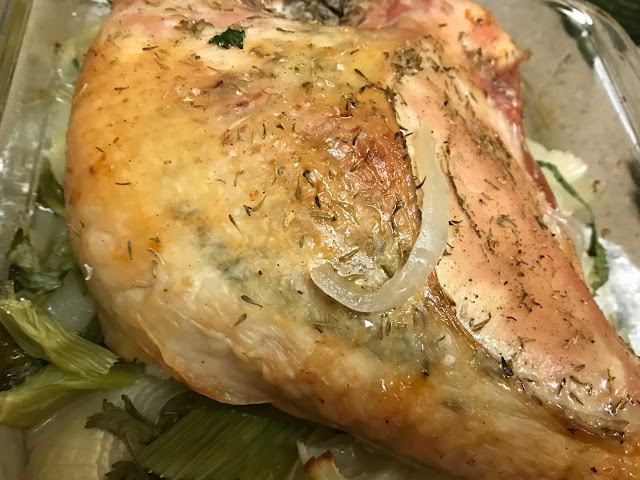 Add a loose foil tent over the breast, or whatever poultry you are roasting if it starts to get too brown, later in the roasting process. Keeping it uncovered will net crispier skin. If you prefer an even moister finish, loosely cover throughout the roasting process. It will be juicier, but the skin will not be crisp. You can roast it covered on the low heat the entire time, then remove the foil cover, and roast on higher heat for the last 20 minutes to help brown and crisp up the skin. A reversed slow roast. Another way that I have slow roasted turkey breast is in a pan on top of sliced apple, celery and onion, which gives the turkey a nice flavor. Place sliced apple and vegetables in the roasting pan, then position turkey breast, thighs, or whole chicken breast or thighs on top. Add a little butter on the flesh, and under the skin. Season well with salt, pepper, and dried herbs as desired. Roast uncovered as above. Ready to make some super gelatinous, collagen-rich bone broth? Recipe linked in the caption of the photo below. Slow roasting is the quintessentially ideal method for busy moms, or working students. Who doesn't love to come home to a meal, ready and fresh from the oven? And, it really is just as good cold the next day or two ~ or three! Experiment and see which methods you prefer. Let me know your favorite methods in the comment section below. Here is the recipe in video: More simple Low-Carb / Hypercarnivore Recipes Here. Here is a recent shopping haul video, with a message at the end, "Don't Major in the Minors!"